German thrash metal legends EXUMER have been confirmed to appear at the Ragnarökkr Metal Apocalypse Festival in Chicago, IL! 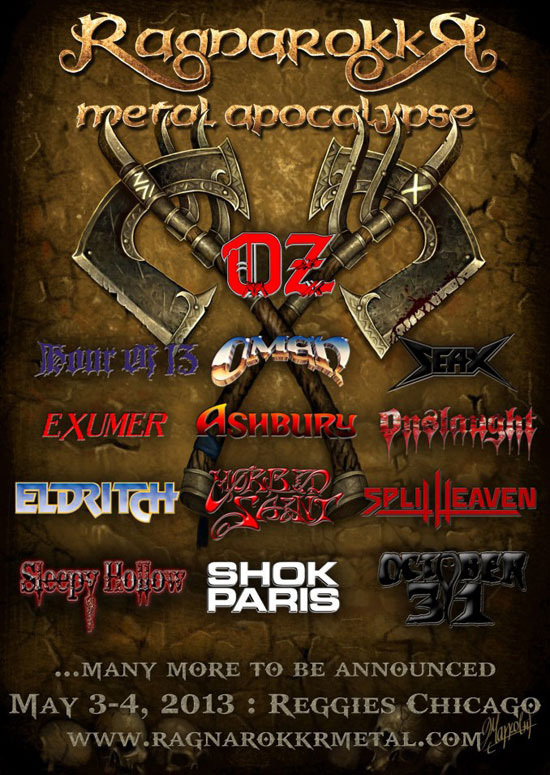 The fest is scheduled to take place from May 3-4, 2013, and also includes Onslaught, Eldritch, Oz, Omen, and many more. Information and tickets can be found at ragnarokkrmetal.com and facebook.com/RagnarokkrMetal. This appearance will be part of EXUMER’s first full U.S. tour in the band’s 27 year long history, which is scheduled to take place April/May 2013. Dates and details will be announced as they are confirmed. EXUMER released their latest album, Fire & Damnation, in April of this year. The album, described by Bloody Disgusting as a “blistering, arcing, glorious moshfest”, is the band’s third full length release and first since 1987′s Rising from the Sea. EXUMER’s debut album, Possessed by Fire, holds exalted status in the thrash underground as being one of the best releases of its era. And now, in 2012, EXUMER has returned to the stage, many years wiser, and as electrifying as ever. Fans can watch the video for the title track Fire & Damnation at metalblade.com/exumer.